Double the “good feeling” when you simultaneously help two great causes. 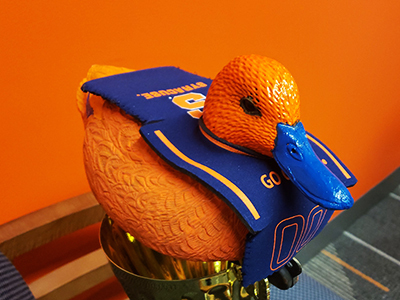 Buy Duck Race to End Racism raffle tickets from one of the Office of Multicultural Affairs’ nonprofit community partners until Saturday, June 9, and you’ll help support the programs and activities of that organization and the Ahmad & Elizabeth El-Hindi Center for Dialogue. Ticket sales are split 50/50. The grand prize for the raffle drawing is a $1,000 shopping spree at Destiny USA. Contact InterFaith’s Gwen Sanders at gsanders@interfaithworkscny.org or call her at 315.449.3552, ext. 119, for a list of partnering organizations and contacts. Besides the free family entertainment and free ice cream from Byrne Dairy, here is what you can expect this year for the 16th Duck Race to End Racism, scheduled from noon-4 p.m. on Saturday, June 9, at Syracuse’s Inner Harbor. Returning for the third year is Terra MakerHall, who is providing fun science and technology activities for children and youth, as well as a video booth and roving reporters, thanks to Syracuse Stories. In addition to the information shared by a diverse array of civic groups and corporate and community duck races, the event also features duck races by youth organizations and school classes and the chance to win an $800 diversity library.